Meg is an excellent cook, and Brendan is a master at the grill. During our stay, he grilled succulent Australian beef and lamb, while Meg whipped up tasty salads and vegetables. Brendan also dipped into his wine cellar and treated us to some fabulous Australian wines. Meg’s Baklava was a wonderful finale to one of our meals. Phyllo pastry is a key ingredient. I haven’t made the Baklava yet, but will soon, heeding the tips below for using phyllo from my friend, food writer Sharon Hudgins. This needs to be made a day ahead of serving. Melt butter. Grease an 11 inch by 7 inch pan (or one of a similar size). If needed cut pastry to roughly the size of the pan . (see below for phyllo tips) Pastry size may vary depending on package and what country it is purchased in. Layer half the pastry (usually from 10 to 15 sheets), one sheet on top of the other, brushing each layer with melted butter. Combine finely chopped walnuts, cinnamon and sugar, then sprinkle evenly over top layer. Fold over any untrimmed edges of pastry. Continue layering remaining pastry, again brushing each layer with butter. Cut into squares with a sharp knife, cutting right down to the base. Bake in moderate oven, about 350 degrees F., for approximately 45 minutes until crisp and golden brown. Combine sugar, water, honey and lemon juice in pan, stir over low heat until sugar has dissolved. Bring to boil. Pour hot syrup over Baklava. Let sit overnight for syrup to be absorbed. If you buy frozen phyllo, let thaw 8 hours or overnight in the fridge. 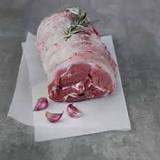 With package still sealed, let sit at room temperature for 15 – 20 minutes. During this time you can make the filling and melt the butter. Put a large sheet of wax paper on the kitchen counter. 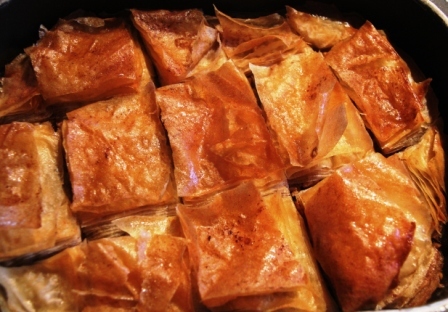 Open phyllo package and unroll onto wax paper so you have a stack of 20 or more sheets. Working quickly, use a sharp knife to trim off 1/4 to 1/2 inch of dough all the way around, cutting through all the sheets in the stack at the same time. This eliminates stuck-together edges and makes the pastry easier to handle. If necessary, cut phyllo to fit the size of your pan while dough sheets are still stacked together. Pull out one sheet at a time and cover remaining phyllo with wax paper, then with a damp kitchen towel on top of the paper to keep it from drying out. (According to another friend, Lynne Cryster, French phyllo pastry does not dry out as quickly as the American version.) Don’t let the damp towel touch the phyllo or the edges, or they will become gummy, sticky and hard to work with. Brush entire top of the layer you have pulled out with melted butter, then transfer to the baking pan. Continue the process until you have stacked as many as called for (10-15 depending on your package), then proceed as instructed above.